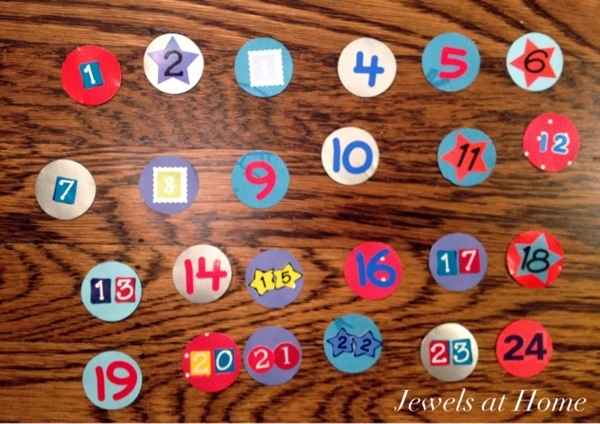 My brain has been whirling with all the creative advent calendar ideas out there. I grew up with a beautiful felt advent calendar my mom made, and I want to recreate something like that for our boys. While I’m still mulling over all the options for the long term, it is the end of November, so for this year, I’ve decided to make a clothespin wreath using Christmas wrapping paper and scrapbook papers to hold 24 cards with activities we can do together through the month. 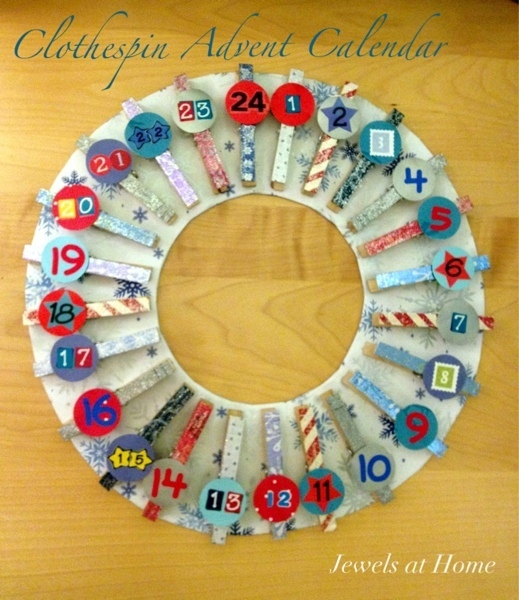 Clothespin wreath advent calendar with an activity for each day. The instructions for the wreath are detailed in the previous post. The only changes were that I made this wreath a bit bigger (13″ diameter) to accomodate 24 pins, and I added numbers to the pins for each day. The numbers are stickers on punched out circles, and I used removable tape to stick them on the clothespins, in case we use this wreath for pictures or cards in the future. 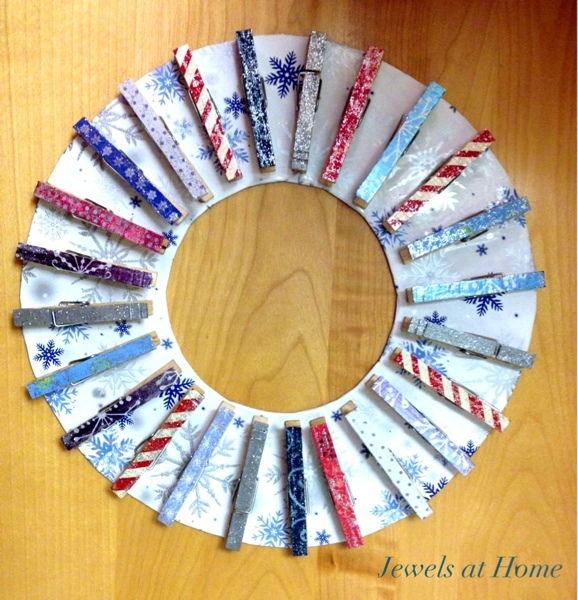 Clothespin wreath for Christmas makes a lovely advent calendar or card display. For the activity cards, I printed 2″x4″ shipping labels with 24 different activities, one for each day. There are lots of options – here are some I thought would be fun to do with the kids this year. I’d love to hear what you are planning, too! I stuck the labels on cardstock in Christmas colors and patterns and then clipped them to the wreath, with the labels facing the back. We can turn over one each day! 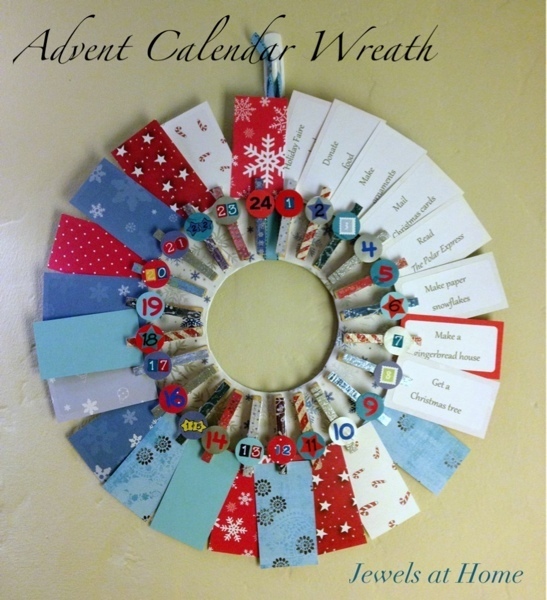 Clothespin wreath advent calendar with a special activity for each day. 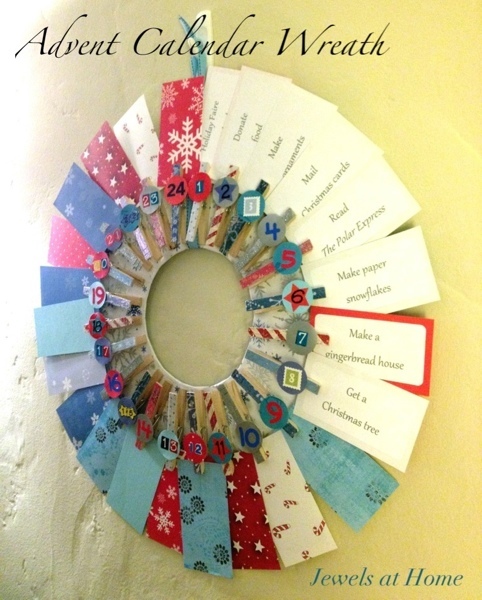 Maybe I’ll come up with a new advent calendar next year, or maybe this wreath will become our tradition. I think I’m at least as excited as the boys for the countdown to Christmas!